Have an easy, comfortable and stress-free journey to the glorious British seaside town of Brighton with this package. With rail tickets included, you won’t have to worry about a thing, just simply sit back and look forward to soaking in sensational sights on the BA i360 flight! Soak in sensational sights of the south coast on the unforgettable BA i360 experience. 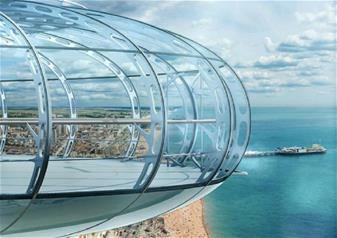 Step into one of the famous glass pods and take to the skies for 360-degree, panoramic views of Brighton and Hove and its delightful seaside. They’re not the only sights you’ll get to see; enjoy views of the South Downs National Park, the UNESCO Biosphere and 49 miles into the distance, the Isle of Wight! An expert guide will be on hand to answer any questions you may have and to highlight key landmarks that you’ll past throughout your 30 minute flight so you’ll be sure not to miss a thing! With the glass pods 10 times bigger than the London Eye and air-conditioned for your pleasure, you’ll be treated to a comfortable, spacious and enjoyable experience throughout. After you’ve experienced the south coast from 450 feet above ground level, you’ll get to enjoy the quintessential British tradition of afternoon tea at West Beach Bar and Kitchen. Settle down to a scrumptious selection of sweet and savoury treats as you enjoy the sensational sea view. Your afternoon tea will include tasty finger sandwiches, mouth-watering scones and mini patisseries alongside bottomless hot drinks to wash down all the deliciousness!